Black Sea, Macdonald’s latest, is no outlier. It comes with a premise that’s well-nigh irresistible to fans of the adventure movie: With the backing of a mysterious financier, a veteran crew of unemployed English and Russian-speaking seamen who’ve been thrown on the scrap heap by their respective nations and navies buy a decommissioned rust-bucket tin can sub from a ship graveyard in Sevastopol and go a-questing for a sunken U-boat filled with Nazi gold which has been resting on the bottom of the Black Sea for some seventy-five years. This line, and the screenplay, are courtesy of Dennis Kelly, who from here on keeps things moving from incident to incident, and bad to worse, at a brisk clip. Animosity between the English speakers and the Ruskies comes to a head in a literal explosion. The sub craps out, and sputters to rest on a sandbar deep beneath the waterline. With oxygen at a premium and the clock ticking, a team of three divers is charged with crossing the murky, treacherous sea floor in search of the U-boat gold, which they then must transport across precarious and scarcely visible terrain. Finally, once every last double-cross has been outed, it remains for Robinson and his depleted crew to maneuver the sub through a treacherous undersea canyon, with scarcely any margin for error. Working with such a succession of made-to-order suspense scenes, Macdonald has considerably more leeway than his protagonist, and his handling of these sequences is consistently capable, if never reaching gut-churning intensity. Despite initial flashes of clarity intended to differentiate the film’s firm-footed sea sections from the seasick landlubber prelude, Macdonald tends to fall back on distilling his set pieces into fragmentary subjective impressions—when the divers are wheeling an overloaded trolley of treasure across the sandbar with the help of a groaning electric winch, nothing is visible beyond what they can see through the feeble illumination of their flashlights, while the sounds of huffing breath and sucking footsteps lend the soundtrack an oppressive intimacy. Almost as soon as the anamorphic lens was added to the filmmaker’s toolkit it was put to use describing the interiors of submersibles in films like Richard Fleischer’s 20,000 Leagues Under the Sea and Sam Fuller’s Hell and High Water (both 1954). Black Sea, accordingly, is composed for widescreen by DP Christopher Ross (for what is apparently his first film on such a scale), though the intention to sustain smothering atmosphere is dissipated by fretful cutting. Rather than Powell-Pressburger’s distinctly Anglo-Saxon mysticism or Huston’s folk-grotesquerie, Macdonald’s style hews close to the currently accepted tenets of realism, a matter of busily plucking out isolated details, which achieves a strangely disconnected and flattening effect at odds with his evident dramatic mission, so that he’s driven to repeatedly redlining the soundtrack to spike tensions. The sub is a warren of dangerous-looking wiring, its crew a gallery of unlovely faces, but despite these surface aspects, Black Sea lacks the heft of experience, the sense of a vessel’s men working as a single unit in tandem, something that you get while watching the tank crew of last year’s Fury, a summarily dismissed WWII picture by David Ayer, himself a former submarine man who wrote the 2000 Jonathan Mostow war thriller U-571. 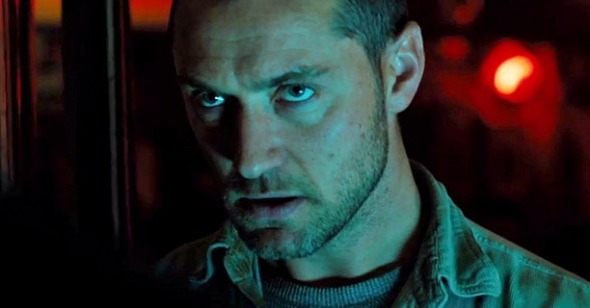 Black Sea is a perfectly dutiful, professional piece of work, with several creditable performances, but it’s the sort of movie that doesn’t have quite enough of any one thing going for it that might eclipse its influences, or the movies it happens to remind you of. Undeniably it is “well-crafted,” that impenetrable descriptor which unites mediocrities as diverse as J. C. Chandor’s A Most Violent Year and Steven Knight’s Locke, but is that all there is? I can’t see Macdonald ever making a film as flagrantly bad as some of Ayer’s worst, or one which flaunts its pulpiness as Mostow’s do, but the leaden competence which prevents one from ever being very bad doesn’t necessarily make one very good.